Baldor buffers are engineered for maximum reliability under the most demanding conditions. All buffers listed are single phase. Three phase is available in 3/4 hp and larger single speeds.Call for details. Single speed buffers are recommended for buffing one type of metal. Pinhole extensions available for all single speed buffers. 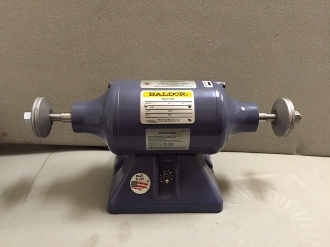 The 111 buffer is designed for buffing small STEEL parts, like nuts, bolts, knives, and small trim pieces. Rpm is 3600. Use either 6" airway pads, or 6" full disk pads. The airway are recommended for buffing trim pieces, and the full disk are recommended for buffing small parts that are snag prone.